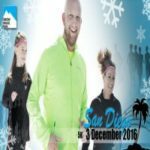 Breathe Deep San Diego: Patricia Marsh Memorial Walk and Fun Run is a grassroots event founded in 2012 to honor a mother who was taken too soon by lung cancer and to give a voice to those affected by the disease. In its seventh year, Breathe Deep San Diego continues to honor lung cancer survivors in the local community, remember loved ones lost to lung cancer, and provide hope to lung cancer patients and their families. Since its inception, the event has raised nearly USD 175,000 for lung cancer research, education, and support.